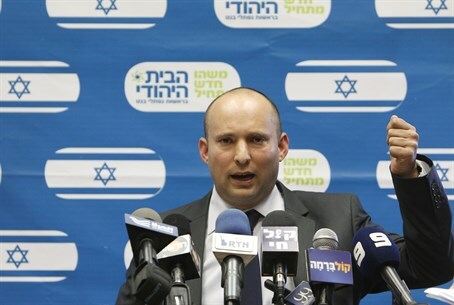 Israel’s leaders must take a truly long-term view when they consider ceding parts of the land of Israel, Minister of Economy Naftali Bennett said Tuesday. “If you look at thousands of years, we’re just a small part of the history of the Jewish nation,” Bennett said, speaking at the Institute for National Security Studies (INSS). “Future generations will not forgive Israeli leaders who give away our land and divide our capital,” he warned. Israel’s leader “should recognize the huge gift we’ve been given of being the guardians of the Jewish nation and of Jerusalem,” he said. Bennett warned in strong terms against the idea of leaving Israelis living in Judea and Samaria under Palestinian Authority leadership - an idea recently floated by sources close to Prime Minister Binyamin Netanyahu. He pointed to the bloody massacres targeting Jews before the state of Israel was established as proof that any Israelis left behind in case of a withdrawal would be in grave danger. “Leaving Jews under foreign leadership is a 180-degree turn for Zionism,” he argued. “What happened to us? What are the implications of raising an idea like this?" “Why should Jews in Tel Aviv live under Jewish sovereignty, while in Hevron and Eli they are not able to live under Jewish sovereignty?” he added. Earlier in the day Bennett issued a similar warning. “Why can’t we let the Palestinians be sovereign over Israelis? Because they’ll kill them,” he stated, in a blunt message to his Facebook page. He added a picture from the notorious 2000 lynch of two Israeli police officers at the hands of a Palestinian Arab mob in Ramallah.